We are still exploring Arizona and the different places to paddle. 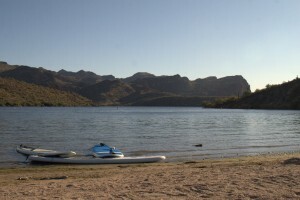 Today we diverted from our normal plan and headed out to Saguaro Lake to paddle stand up. 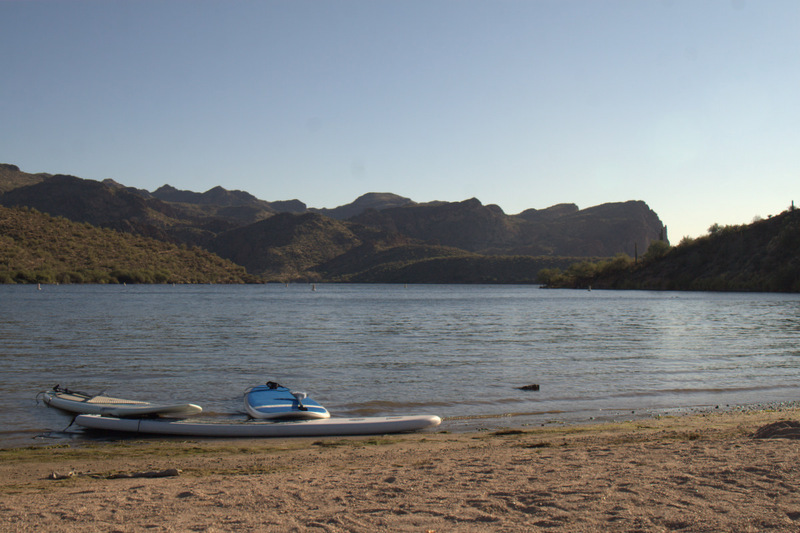 I’d been out to Saguaro Lake (map) many times but that was all years ago and it was always to waterski so I didn’t really know what to expect with regard to SUP. We were excited to get to an Arizona lake with a bit more scenery and a bit cleaner water. 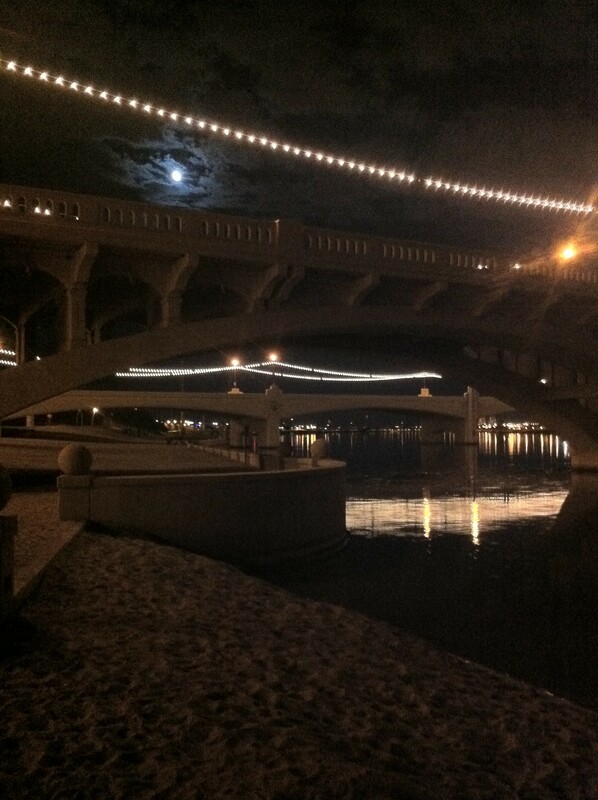 It turned out to be awesome and very different from Tempe Town Lake. We went to Butcher Jones beach. It’s a nice large beach with some sand(ish) and patches of grass. 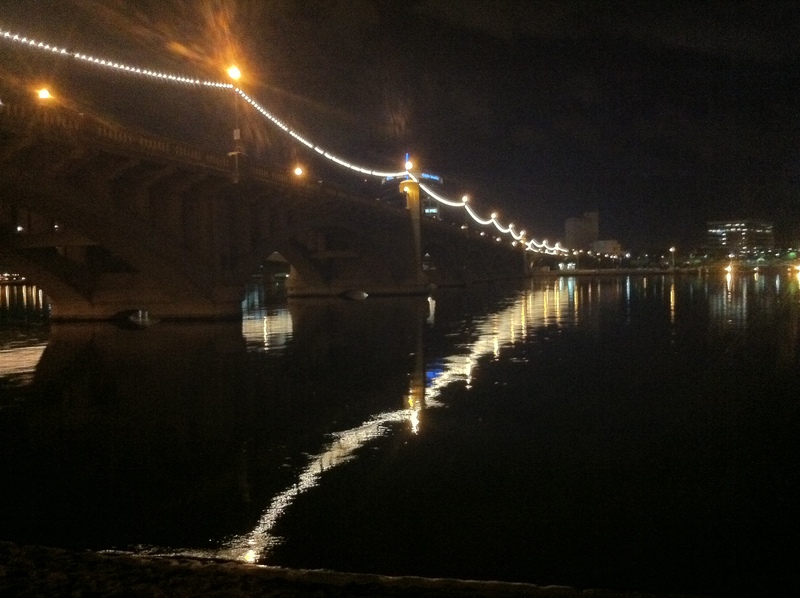 Looking at the water, it definitely looked a good deal cleaner than Tempe Town Lake. Plenty of area to set up a comfortable spot. There are also some nice amenities there but I didn’t really look too closely. I did see that there are grills, bathrooms and spots with shade but I was mainly there for the water. The beach is pretty. It’s a little cove with some (kind of) sand. There are hills and mountains surrounding and there a couple lines of buoys a ways out for a no boat zone (inner line) and a no wake zone (outer line). 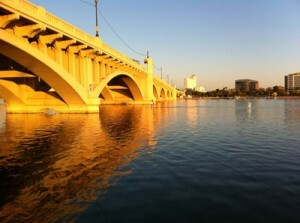 To get to the subject that most SUP fans care about, the water is indeed a good bit cleaner than Tempe Town Lake. At the time we were there (afternoon) there was also a lot more movement in the water. There was a strong wind and a good number of small waves rolling in. I’m guessing those were mainly from the boats passing out in the main part of the lake. I’ve been thinking of trying one of those SUP races over in CA (since we don’t have many at all in Arizona). 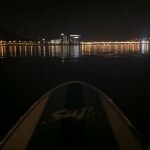 I know that paddling SUP in the open ocean will be far different from a closed body of water like Tempe Town Lake. 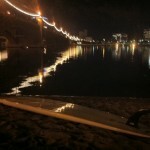 While I paddled tons of open water off Long Beach, Kauai and Oahu, I still have yet to experience it on a SUP. Saguaro Lake was a good first step. I’m sure that the waves and chop were miniscule compared to open water but they were significant compared to TTL. They made for a great workout. We loved the instability and the variety. Several hours later, I can tell I’m worked in very different ways than a typical TTL workout. My midsection and rib area are already a bit sore (which is cool). I think the instability caused many more muscle groups to be called into play. Heading straight out a good distance (past both buoy lines) and then turning around and racing back in gave you a bit of a chance to work to catch some bumps. Nothing major but at least it was something. I didn’t think we were going to get that opportunity anywhere in Arizona. 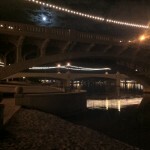 I guess the telling thing to say is that we will likely be spending far more of our weekends at one of the outer lakes (such as Saguaro, Canyon, Pleasant) instead of Tempe Town Lake. The combination of cleaner water, chop and bumps and scenery definitely makes the additional drive worth it. You need a Tonto Daily Pass. It’s $6 and it’s good for one day. You can buy them ahead of time online or at locations around town. Then you just rub off the spots for the date and time. FYI: The Tonto Daily Pass has spots for watercraft stickers. You don’t need these. These are only needed for motorized watercraft. Like all lakes, if you want still water, you want to go early or late. As the day heats up, the wind picks up and you’ll also get lots more chop. The water is quite shallow for quite a bit. Make sure you walk your stand up paddleboard in to a spot where you’re not going to be dragging your fin. There is a good deal of plant life in the water – some reeds and some other lake weed type stuff. Look out for that when you’re paddling. As the beach is pretty broad and it is so shallow, you’re going to have to walk in a bit. If you have something like water shoes or Vibrams, I’d give those a try. I haven’t paddled in my Vibrams but I hear it’s pretty good. My buddy who had his on was digging them. If you’re barefoot, stick to the left half of the beach where it looks like there is mud under the water. It is mud but it’s much more comfortable on your feet. If you stay toward the right side of the beach, you’ll end up walking on lots more rocks and pebbles. Not much fun. If you do have your flip flops on around shore, be careful in the mud though. When I was moving boards and putting boards away with my flip flops on, the mud definitely stuck to them, holds them down and takes a second to release. Just take your time so you don’t fall. 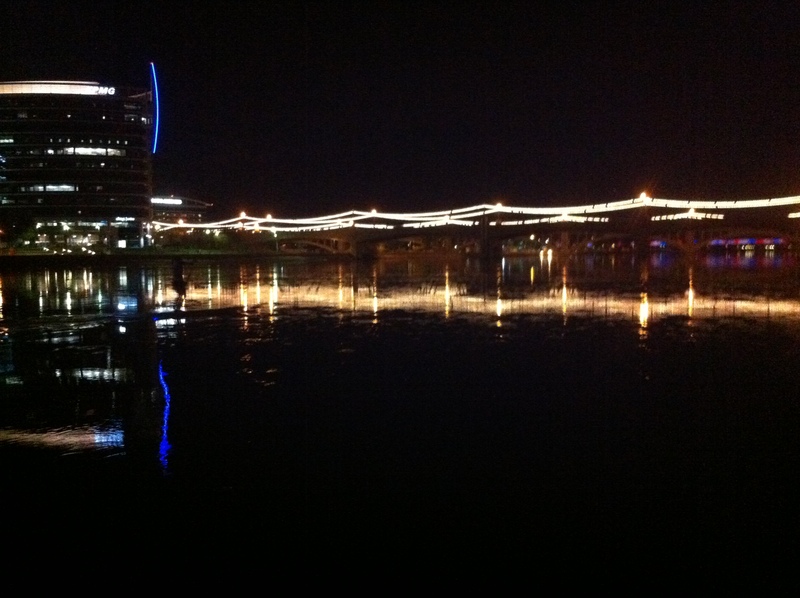 I tend to paddle a bunch at night. I usually work late so getting up super early is rough. Then I work until the day is done, go home & eat dinner with my family. After the kids are down, a couple times a week, I’ll load up and head out to the lake for a workout. 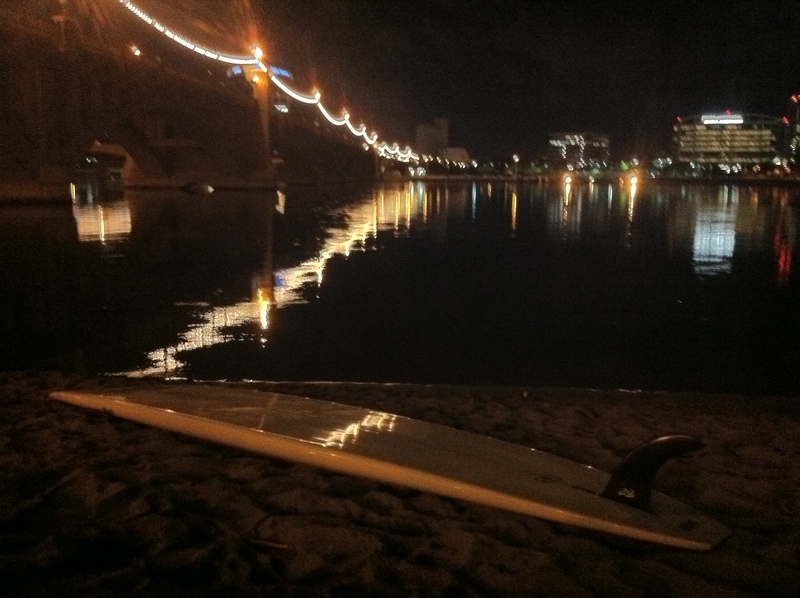 So far, I’ve just paddled at night at Tempe Town Lake. I don’t really see that changing so some of my comments are specific to TTL. 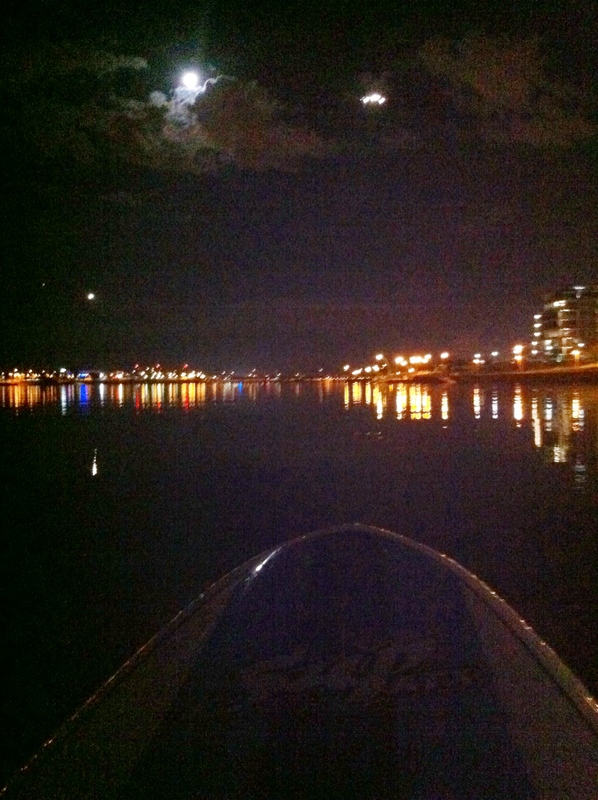 Paddling at night is very, very cool. 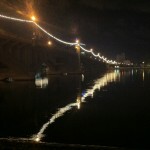 It’s beautiful out there with all the lights reflecting off the water. 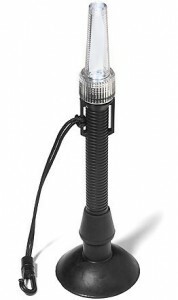 There is a bunch of ambient light so it’s easy to see what you need to. Then it’s also dark enough to make it seem like a completely different experience. Obviously there is no sun beating down on you so that is great. It also always seems extra calm. Talking with one of the rangers, I hear that it’s typically quite calm (no wind) in the evenings. That results in a glassy surface which is lovely to paddle on. If you are going to paddle Tempe Town Lake, it is open for boaters from 5 am – 10 pm so make sure you’re off the water by 10. As far as details, if you’re going to paddle after sunset, you need a light by law. 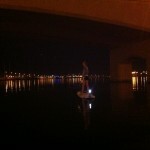 For paddling SUP, you just need an all direction white light. 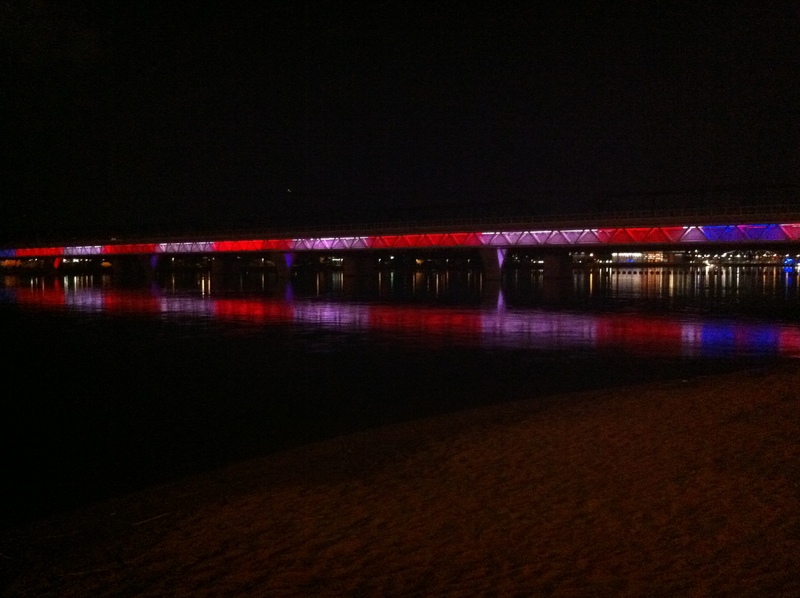 There are a few different types of lights. 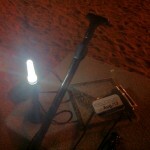 We’ve settled on an elevated light that attaches to the stand up paddle board in a couple different ways. We actually use 1 of 2 different types depending on the board we are paddling. For my standard epoxy fiberglass board (a SUP ATX lake rider LR model), I use the Paddlers Supply Company LED Kayak Deck Light with Suction Cup Base from REI. It’s about $40. It has a very strong suction cup that sticks to the fiberglass surface. No worries that it will fall off. It’s super easy to put on and super stable. Then it has the clip that I attach to the leash cord just in case anything were to happen. No issues with this. Quick on and off. Bright light. Doesn’t get in the way of paddling at all. Now when you have one of the comfort top boards where the padding stretches the full length of the board, the suction cup option isn’t going to work. For our SUP ATX comfort top HR board, we use the Kayalite® Deck, Anchor and Stern Light. It’s also $40. The light itself is pretty much exactly the same as the other model. The way this light varies is in the attachment mechanism. 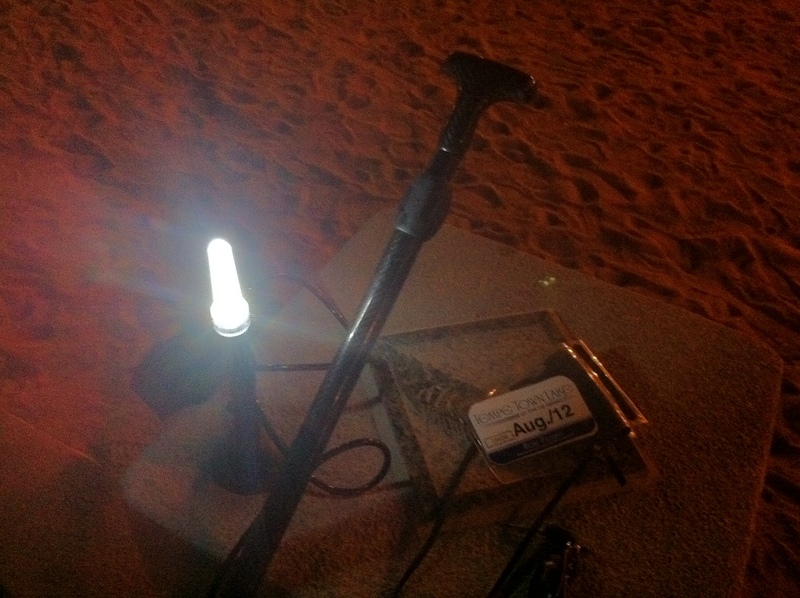 Since there is no open fiberglass to stick a light to the board, I clip it to the leash anchor point. I can’t actually get the clip around the bar so I’ve attached a thick zip tie with just a little slack. You cannot attach it directly to the leash cord either as there would be too much slack when attached. So I attach the clip to my zip tie and then I pull the other end of the bungee to eliminate slack and tie it off on the light. If we’re out with friends, we still go out to Boat Beach as I like the feel down there. 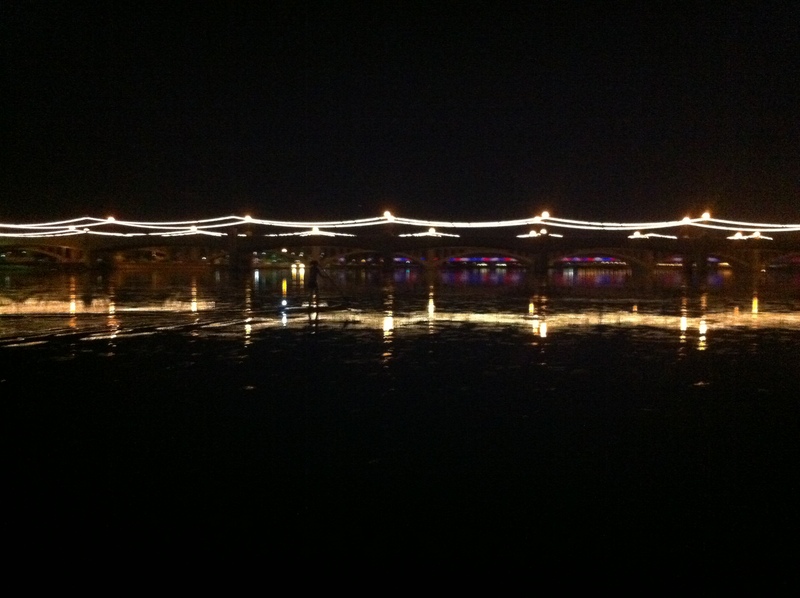 I like being with the bridges. 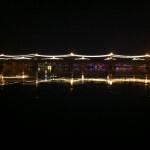 If you have people that are waiting on the bank, it’s a bit nicer there in the evening than the Marina. 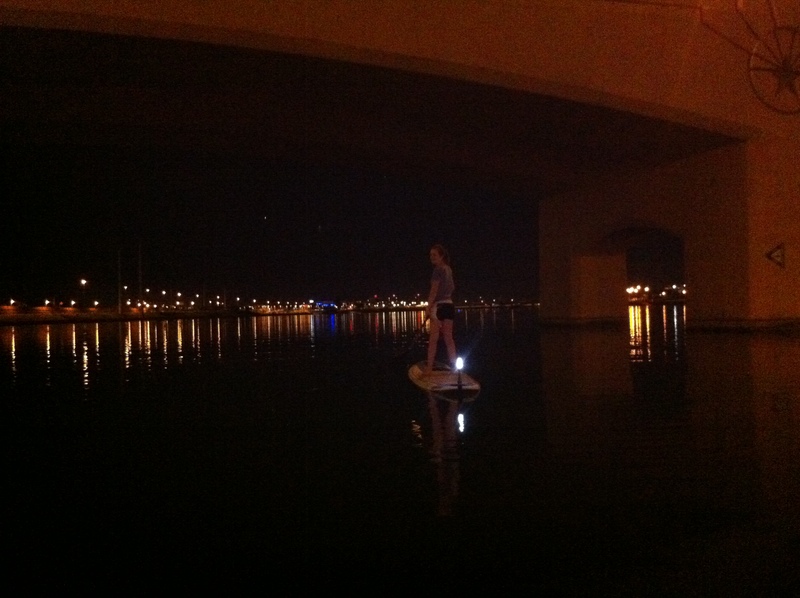 If I’m by myself or 1 other person and basically doing a workout paddle, I go to the Marina. You can drive right up and drop your board and equipment steps away from the water. I drop my stuff on the grass right near the boat ramp. Then it’s easy to park very, very close. 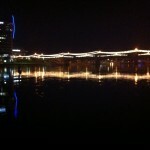 I typically either head west toward the lighted bridges or on occasion will go east toward the other bridges. If you go west toward the lighted bridge, rounding a pylon and heading back to the boat ramp will give you a workout of about 1.1 miles. Then getting out at the Marina is a breeze. Just walk your board up off the boat ramp to the grassy spot grab your car, strap your board on and you are ready to go. 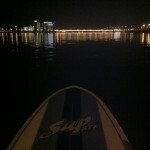 One other bonus of paddling from the Marina at night is that you don’t have to deal with any sand which is nice. Another random tip: I now don’t worry about stashing my flip flops anymore. I just chuck them on the front of the board pad and they don’t even move over the course of a workout. We started this journey with borrowed boards. At a certain point, we needed to give those back and were unable to quickly fill the void. So I began an effort to procure our own boards. I did a bunch of research and determined that for what we needed (at this point in time), we would go with SUP ATX. Our SUP ATX boards and paddles came in at the same time that my back went out (just over a week ago). We got a small paddle in last Monday just to get on the water but it didn’t feel like it really counted. It was super abbreviated and it just didn’t feel very good. Not paddling for a month or so definitely affected our paddling fitness and our stroke. Heather and I each did a couple runs. While the 1st run for each of us was rough, the 2nd was an improvement for both of us. Over the course of this week, I continued to hydrate & stretch (will share my paddling stretching routine soon) and try to put the back issues behind me. The back is still a bit creaky but definitely a good deal better. This weekend was crazy busy but thanks to Heather, I got a decent paddle in on Saturday. 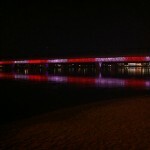 I did about a 1.75 mile loop on Tempe Town Lake. While I started to find my stroke and get used to the new board and paddle, it still hurt. Fitness is not there and my left arch was killing me the entire time. One thing that I really like about paddling is that it lets you know if your body is off in any way. 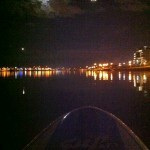 When we were paddling a good deal before I felt it in my lower back, my glutes and hips. I could tell that I needed to stretch well or I was going to be in big trouble. Over the weeks, the stretching greatly helped and I felt better and better. I also have a bit of an arch pain issue which I managed by paying attention to my feet during paddles (basically ensuring I was not gripping at the board with my toes). Well today with the arch pain, it was obvious that my body is still not in prime shape for paddling. I’d spent the past month on crazy projects and a business trip and since I wasn’t paddling or in the gym, I slacked off pretty hard on my stretching routine. I’ve been working it again but I still have a way to come. With the mechanics of paddling, I think any problem in your kinetic chain is emphasized. I’m sure my arch pain is a part of the whole lower back, glutes, hips and calf stuff. Happy to have the signals telling me that so I can actually rectify the problem. I will also say that the paddle reminded me just how much our bodies love to work. Afterwards I was breathing pretty good and my heart rate was up. My body was almost smiling. Just felt like a machine that was finally getting warmed up again. Many of us spend way, way too much time letting our bodies rust from disuse. 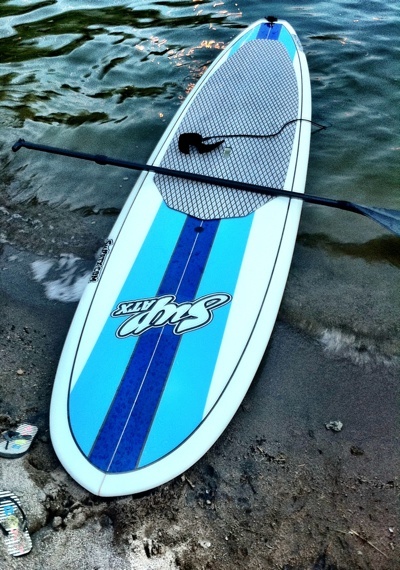 So a first step taken… I’m glad and now that we have our own stand up paddle boards and paddles, I just have to figure out a permanent routine to start getting on the water as much as we were in the summer. 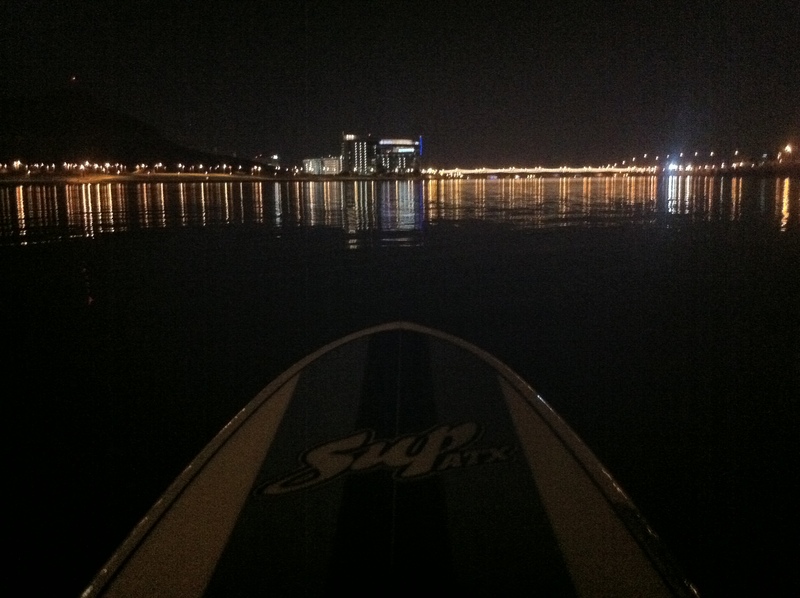 Let us know if you’re going out or if you just want to try SUP. Love to connect! 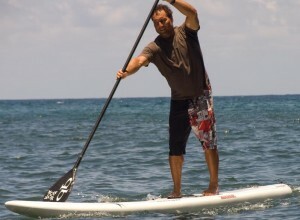 I came across a tip in Dave Kalama‘s most recent blog post on the 3 most common mistakes in stand up paddling that I really liked. He gives a great analogy that really illustrates the need to keep the stroke light and fluid. In case you don’t know him, Dave Kalama is one of the greatest watermen there is. At 46, he is still placing at the very top of the biggest races there are. He took 4th in the Maui to Molokai and Molokai to Oahu channel crossings in a sport that is being dominated by youngsters (a 16 year old having won most of the races this year). He is one of guys who invented tow-in surfing (along with Laird Hamilton, Darrick Doerner, and Buzzy Kerbox) and surfs the 60+ foot waves at Jaws off Maui. He also (along with Laird Hamilton) is responsible for making stand up paddling popular. Heather and I were lucky enough to attend one of his Kalama Klinicks recently in Newport Beach. We made the trip out to California just for this clinic & then headed right back to Arizona. Dave champions a “Tahitian” style stroke. It is a shorter stroke emphasizing reach and keeping all of the work in front of you (unlike the long “Hawaiian” stroke). I’m a big fan of his and his teachings. The third and perhaps most important mistake I see, is people working way too hard. One example I’ve been giving people lately is this, imagine drinking a glass of water. You would grab the glass with very little effort, you would bring it to your mouth with very relaxed muscles, and doing almost no flexing of your muscles at all. Now imagine grabbing the glass with so much effort you almost smash the glass, imagine bringing it up to your mouth now with every muscle flexed like a body builder posing, the glass would be vibrating and water spilling over the rim. While that my be an exaggeration, I do see people exerting that type of force while trying to paddle. Paddling most of the time needs to be a very flowing and rhythmic action, not a tense muscle flexed series of positions, but rather a constant continually moving movie. Don’t get me wrong, there is a time and a place to exert yourself, but if your base stroke comes from a place of rhythm and flow, when you exert yourself you will be much more effective and efficient. The best fix for it is to greatly reduce your power level and learn how to use your technique as your driving force, not your power output. Decrease your power to the level that you don’t feel like you’re doing any work at all, and just concentrate on technique. You’ll be surprised at how fast you go. Just like drinking that glass of water, get to a point of calm relaxed movement before you start chugging. With many of the top races being quite long (30+ miles) and most of the standard races being good distances (5-15 miles), it’s critical to develop a stroke that you can maintain for extended periods. As Dave recommends, take some time practicing staying loose and fluid and see how it helps. See his other top 2 tips at the 3 most common mistakes in stand up paddling. w00t! New boards are arriving tomorrow! 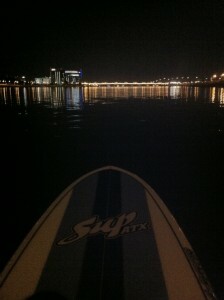 Bought boards from SUP ATX out of Texas. We’ve paddled them once and thought they handled fine. At this point, we are just looking for an affordable way to get a couple boards so we can get out on the water whenever we want. We did look at a bunch of other options but for the budget we had, nothing else was readily available. 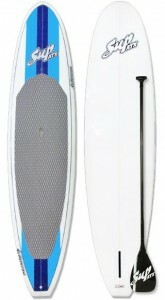 I do like the Surftech Joe French boards but they are pricier and they were out of stock – something that seems all too common in the SUP world. New 2012s look killer too but they won’t be out for a while. SUP ATX has pretty much an unmatched deal for someone getting started in the sport. If you haven’t looked at equipment at all, boards alone often range from $1,000 to $2,500+. And the good carbon fiber paddles can go up to $400. 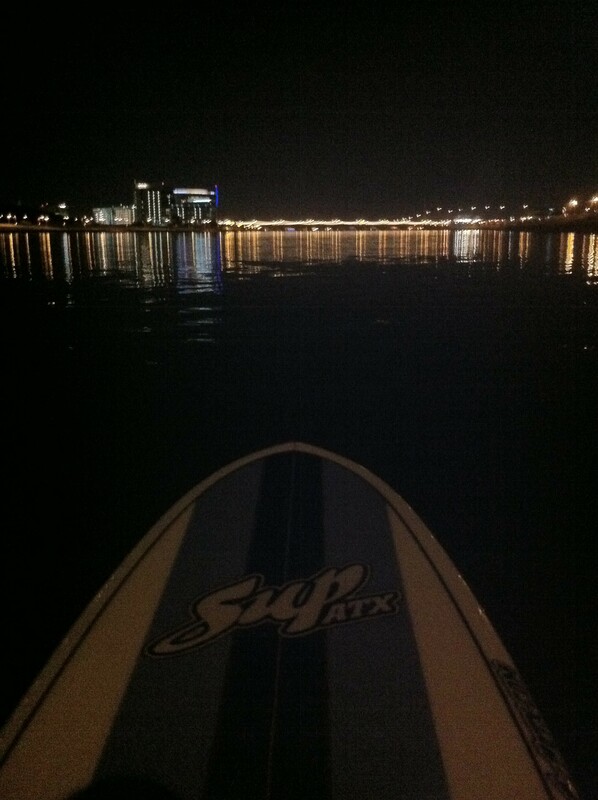 With that being said, SUP ATX gives a very affordable option out there for a standard board. They run under $1,000 for BOTH the board and a carbon fiber paddle. Looking forward to breaking them in!